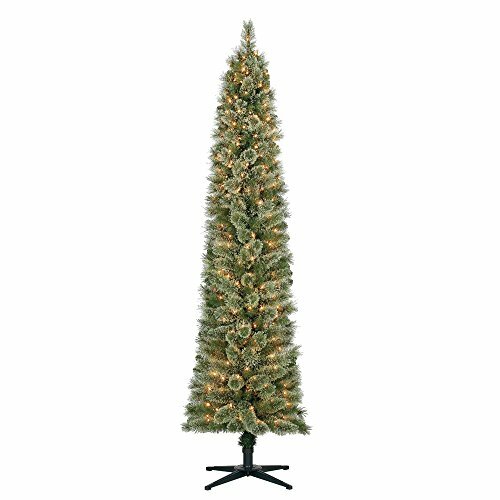 You'll be rockin' around this Home Heritage 7-Foot Stanley Pencil Pine Christmas Tree and getting your Christmas party hop on with this beautiful tree in your home. Let the Christmas spirit ring in your residence this season. The Stanley Pencil Pine may be tall and slender, but it is full of holiday magic. It's the perfect tree for smaller spaces and places because it stands 7 feet tall and measures 19 inches in diameter on a sturdy, folding metal stand. This tree comes pre-lit with 350 crystal clear lights that illuminate your living room with an enchanting flair. It's verdant and lifelike with 335 branches that bring an exquisite holiday charm to your Christmas festivities year after year. Grab a cup of hot cocoa, sit by the fire, and have a holly, jolly Christmas when you setup the Home Heritage Stanley Pencil Pine Christmas Tree. If you have any questions about this product by Home Heritage, contact us by completing and submitting the form below. If you are looking for a specif part number, please include it with your message.